We are proud to announce that we have recently passed our annual reassessment of this Quality Mark of the Law Society and have achieved the new Lexcel 6 standard. 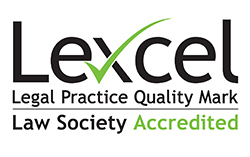 Lexcel is the Law Society’s legal practice quality mark for excellence in legal practice management and client care. It provides a framework to help practices develop consistent operational efficiencies and client services, manage risk effectively, reduce costs and promote profitability. It is the most appropriate standard for the legal profession as it was written by solicitors for solicitors. The Lexcel standard sits alongside our other accreditations from the Law Society – we are members of Conveyancing Quality Scheme which demonstrates excellence in residential property matters; and also of the Wills and Inheritance Quality scheme which confirms best practice in Wills and Estate Administration advice. We are the only Legal Practice in Carmarthenshire to have achieved all three standards.